The Galaxy S 4G retains everything I loved about the Samsung Vibrant, but with an upgrades to "4G", a front-facing video camera, and a 1650mAh battery. It's certainly not a revolutionary new device, but it's a welcome update. Beyond these changes, the Samsung Galaxy S 4G is essentially identical to the Vibrant. Because of the similarities, much of my review for the Samsung Galaxy S 4G is the same as for the Vibrant. One final difference to note, the original Vibrant comes with Avatar preloaded. The new Galaxy S 4G comes with Inception—I'll let you decide whether that is an improvement or not. No doubt current owners of the Vibrant will be further embittered that they still haven't received the long expected upgrade to Android 2.2. It's not clear whether the launch of the Galaxy S 4G will accelerate or further postpone that process.UPDATE 2/25/11: T-Mobile has released Android 2.2 for the Vibrant. It is not available over-the-air, users must download the update using Samsung Keis software. Complete instructions can be found here. Other areas of the story have been updated accordingly. The Samsung Galaxy S 4G comes to T-Mobile on February 23rd. The Samsung Galaxy S 4G is amazingly light for its size, weighing in at only 4.2 ounces. The low weight, combined with the slim profile (4.8 x 2.5 x 0.4 inches), makes the Galaxy S 4G very comfortable to hold. The glossy finish of the Vibrant backplate has been replaced by a slightly textured finish, making it more secure to hold. Otherwise, the case is identical to the Vibrant. Build quality is a step below the HTC MyTouch 4G, but the slightly chintzier plastics provide a weight advantage (4.2 ounces versus 5 ounces for the MyTouch 4G). The Samsung Galaxy S 4G continues to shine in the display department. It has the same beautiful 4-inch display (800 x 480) Super AMOLED display of the Vibrant, with rich colors (that can become oversaturated) and terrific brightness. At the time the original Galaxy S phones came out, the AMOLED display was the leader of the pack. Soon, Samsung will be bringing its Super AMOLED "Plus" displays to market and the display on the Galaxy S 4G will be a step behind. That said, it is still a very nice display that should please almost everyone. As mentioned above, T-Mobile is shipping the Galaxy S 4G with a full version of Inception pre-loaded. Technically, the Samsung Galaxy S 4G is not "true" 4G, because it operates on T-Mobile's HSPA+ network. However, it is capable of supporting T-Mobile's newest 21Mbps HSPA+ network, which makes it the fastest 4G phone on the T-mobile block. So how fast is it really? Well, don't expect anything close to that 21Mbps theoretical speed. In my testing in Manhattan, the Galaxy S 4G average around download speeds of around 3Mbps, with a peak of 6.5Mbps. But it was consistently 30-50% faster than the MyTouch 4G (which is can only support speeds up to 14.4Mbps) and twice as fast as the Vibrant running on T-Mobile's 3G network. Upload speeds were identical between the Galaxy S 4G and MyTouch 4G, at around 1.5Mbps, but were 3-5 times faster than the Vibrant on 3G. Depending on where you live, your results may be consistently faster (or slower). Beyond speed, the Galaxy S 4G runs Android 2.2.1 and supports Flash web browsing. The Galaxy S 4G can act as a mobile hotspot for up to five devices. it's easy to set up and worked great in my testing. The Samsung Galaxy S 4G has a 5MP camera, 720p video recording and TV-out output capabilities. Unlike its competitors, but like the Vibrant, the Galaxy S 4G does not have a flash. Shots on the Galaxy S 4G were identical to the Vibrant, and were very good, even in low-light conditions. Colors tended to be slightly oversaturated, but were more pleasing, generally, than on the MyTouch 4G. The camera menus were not intuitive, with similar functions divided into different navigation menus. The variety of shooting modes and scene options, as well as some fun cartoon effects, were great once you found them. The 720p video recording was fine, but I would still opt for a standalone camcorder if I were filming anything I wanted to save for posterity. With 4G comes a front-facing VGA camera for the Galaxy S 4G. It's not the 1.2MP resolution of many of the other cameras coming this spring, but is adequate for video chat. The large display of the Galaxy S 4G allows for a nice, big virtual keyboard. I found the keyboard very easy to use and the built-in Swype made virtual typing a breeze. Navigation was very similar to other Android phones, with seven panels, each customizable with various widgets and apps. The Galaxy S 4G was responsive, though no more so than the Vibrant (not surprising given they share the same 1GHz processor). In general, I prefer HTC's Sense interface over Samsung's Touch Wiz. Some basic tasks, such as unlocking the screen, require much more precise movements on the Galaxy S phones and I prefer HTC's scrolling app list over Samsung's tabbed list. But these are relatively minor quibbles. When it comes to the physical buttons, the Galaxy S 4G's touch-sensitive main navigation buttons—for Menu, Home, Back and Search—create a sleek exterior, but make touch navigation more difficult than other phones, such as the MyTouch 4G. And the side button to unlock the screen was less convenient than the front button on the MyTouch 4G. The Samsung Galaxy S 4G comes with a 16 GB microSD card and will support up to a 32 GB microSD card. Total storage is actually less than the Vibrant, which had 16 GB of on-board memory plus a microSD card slot, but it should still be plenty of room to store your library of songs, videos and photos. I didn't have time to do extensive battery life testing, but my initial experience showed that the Galaxy S 4G could last through the day under normal use. The battery is larger at 1650mAh than the 1500mAh in the Vibrant, but with the Galaxy S running on "4G", it's unclear if that will lead to longer life on average. 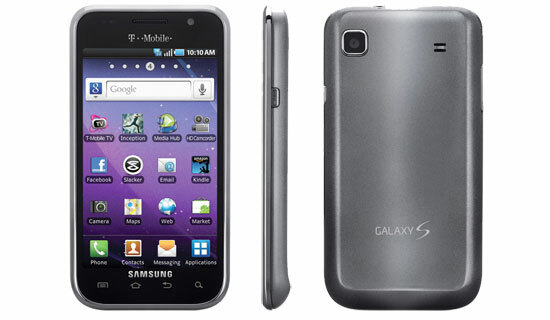 The Samsung Galaxy S 4G will be available on February 23rd at T-Mobile for $199.99 with a new, two-year customer agreement. Wirefly already has it discounted to $139.99 . The Samsung Galaxy S 4G and the HTC MyTouch 4G are the best phones on T-Mobile and, in my opinion, the best "4G" phones on the market. Both offer almost every feature you would expect, in a slim form factor. Neither contain the dual-core processors on many of the news phones arriving this spring, but I doubt most users will need that extra power. If you're deciding between the Galaxy S 4G and the Vibrant, there's no question you should go for the Galaxy S 4G. Between the Galaxy S 4G and the HTC MyTouch 4G, it's a harder call. The Galaxy S offers faster speeds, an arguably better display and slightly lighter weight. While the MyTouch 4G offers better build quality, a slightly better interface and a much lower price, only $99.99 on T-Mobile or $29.99 on AmazonWireless. It's going to come down to personal preference. Nice review, but please get your facts straight. 2.2 was released for the vibrant in january, on the 19th I believe. Either way, I now own the vibrant 4g, and it is indeed an excellent phone. As I’ve bought and sold and used quite a few smartphones, the vibrant 4g is the one I landed on as my favorite and the one to stick with. T-Mo did release an update for the original 3g Vibrant. However, it was done quietly through their forums, citing it as an optional upgrade. Unfortunately, it is not being applied OTA and does require downloading the Samsung Kies Mini program and installing via computer. So how do you feel the vibrant 4g will compare with the g2? I like everything about the g2 except the keyboard. Don’t like some of the restrictions I get on the mt4g, though. I have ten days left in my trial period on the g2, and with this one coming out today, wondering if I should go with this samsung instead. I’m not a big fan of physical keyboards on smartphones - they add a lot of bulk and weight, and I prefer using Swype to type. So unless you need the keyboard, you are probably better off with the Galaxy S 4G or MyTouch 4G. Not sure what “restrictions” you’re referring to with the MyTouch 4G, but it’s a great phone. The key benefits of the Galaxy S 4G is the faster 4G speed over the G2, better display and much lighter weight. Yes, it has Swype. All Android phones will play music and video from a wide variety of sources. If you’re buying, check out Wirefly’s price (see link above in Pricing and Availability). They often offer much better deals than buying straight through T-Mobile. Though a T-Mobile store will likely offer more hands-on assistance getting your phone set up, if you need that.